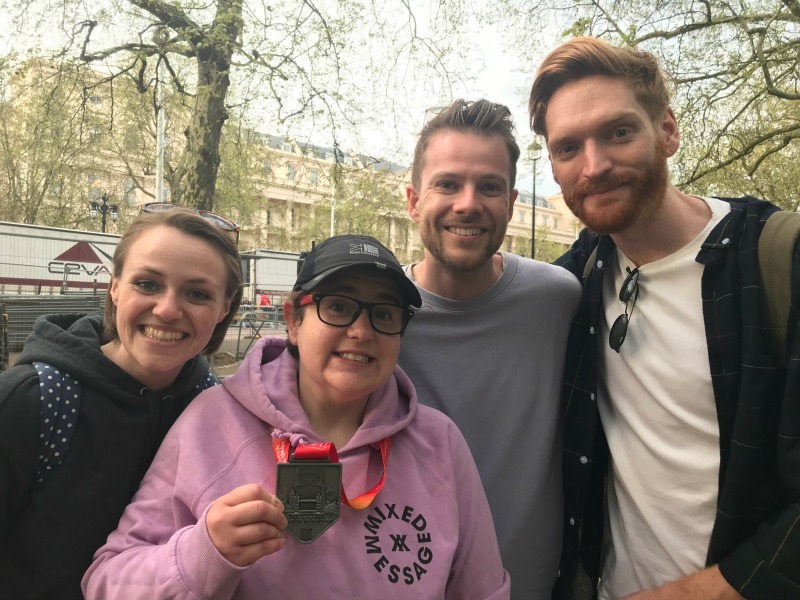 If you’ve found yourself here reading my experience of running the Virgin Money London Marathon 2018 and you haven’t read part 1, then head over there first to read about the first half of the run. Once you are done come back to read the second half. 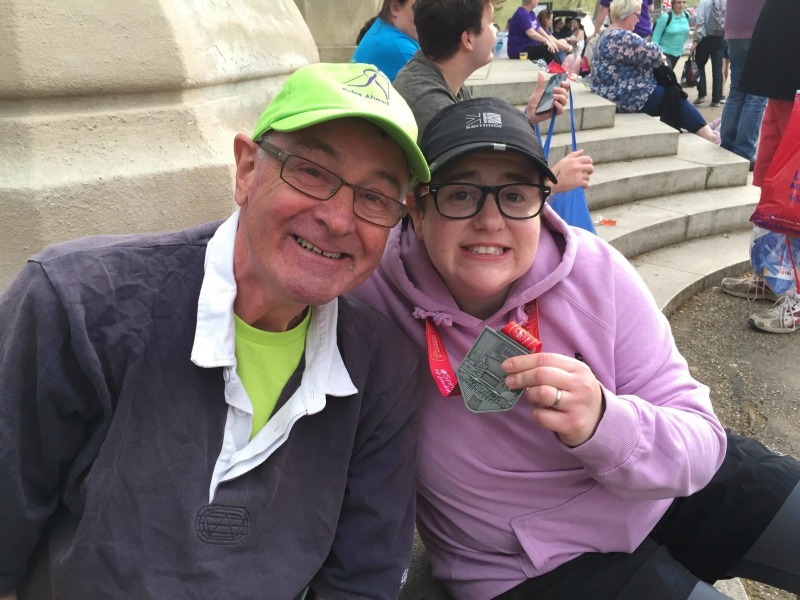 If you are all caught up the first half then please grab a drink and enjoy reading about my 2nd half of the Marathon. As I crossed Tower Bridge I was very aware that the course was closing up behind me. I was determined not to run my Marathon on the path and wanted to keep ahead of the final sweeper vans. As you come off Tower Bridge you are met by a sea of people running in the opposite direction. These people are already on their final stretch having ran round Canary Wharf. It can be a bit daunting as a slower runner being faced with those running full steam still on their 22nd mile. But I was feeling boosted by seeing my family and cooled by the frozen water my mum had managed to pass me. I was also happy to see friends for the second time on the course, waving a sign for me. The bottle felt really heavy in my hands as I approached the half marathon mark, so I tipped some of the ice cold water over my back and neck to cool me down and to lighten my load. I realised I was a bit behind on my fuelling plan due to feeling out of sorts at mile 11 so I decided to take on some salts in the form of a sachet of Pip n Nut peanut butter. It tasted amazing and did the trick in helping me focus on pushing forward. People to the left of me were dropping hard onto the barriers, the heat was picking off it’s victims one by one, with me narrowly missing being thrown up on at last 4 times by 4 different runners. The St Johns Ambulance crew were racing back and forth across the course providing oxygen and medical aid to very poorly looking runners. I was starting to grow concerned by the water station situation as it became very obvious the stations would not be providing water for us slower runners. Luckily I chose to sip the water I was carrying to allow me to make it last as long as possible. Spectators offered us water from their backpacks, medical volunteers handed out latex gloves full of ice and a lady ran from a pub with a large bowl of ice allowing us to scoop handfuls of it onto our bodies in an attempt to keep cool. This section seemed to go on for quite a while. I managed to make several calls to my Dad and Clara to see where they could meet me next, as I was desperate to take on more water and needed to see some friendly faces as the crowd was growing thin in places. I cranked up my music and used it to help me sing my way through the pain. As ‘Someone Out There’ by Rae Morris came on my playlist tears streamed down my face. 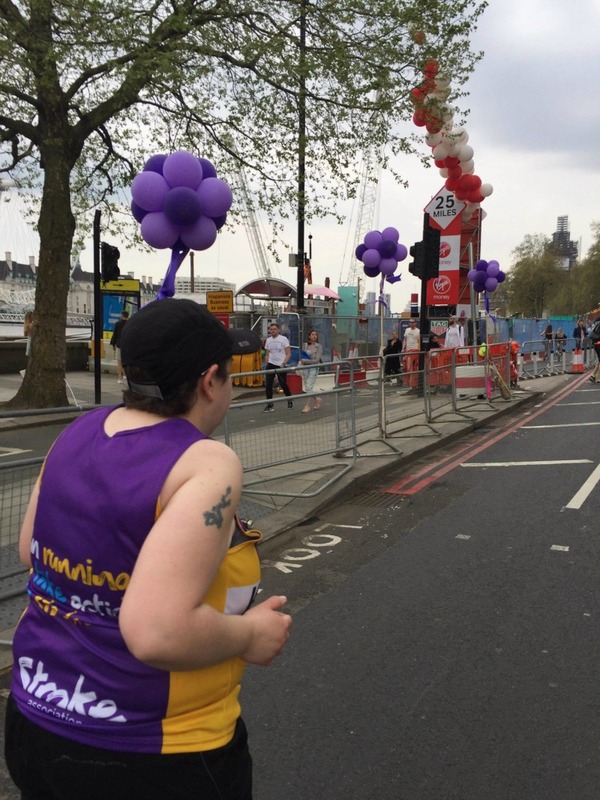 I felt quite lonely at points through the Marathon, but when I managed to reach for my phone I was able to see so many sending me encouraging messages as they tracked me. I felt like people were really rooting for me to finish. 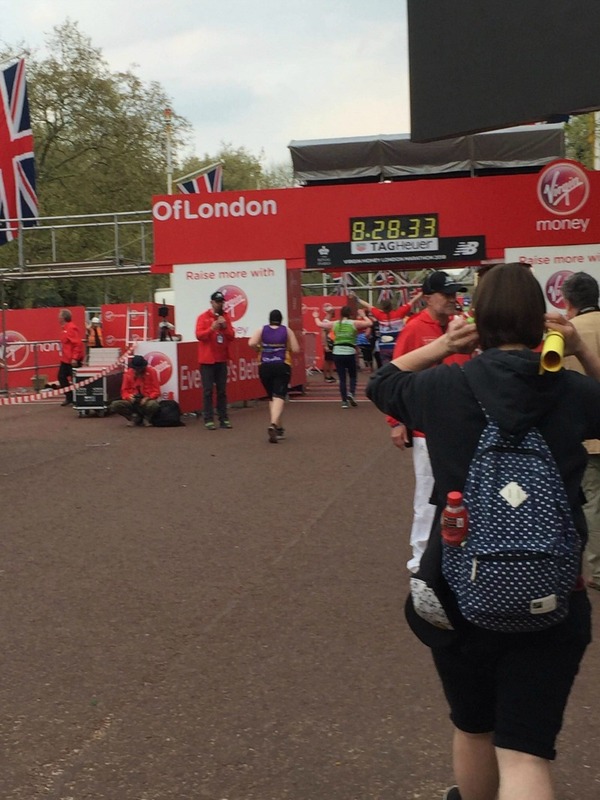 There was no way I was going to be beaten by the hottest, biggest Virgin Money London Marathon ever. As donations pinged on my phone I reached into my bumbag, popped some Calpol instants into my mouth and chomped on them to the sounds of Eminem ‘Lose Yourself’. Eventually I was in a tunnel and soaking up every bit of shade I could, I knew I couldn’t slow as I had developed pain in my right hip and could feel the distant sting of a blister just starting to appear on the pad of my foot. Luckily the painkillers took the edge off the pain after about 20 minutes, so again I was able to pick up the pace slightly. But my walk/run pace had grown into more of a walk walk run shuffle walk shuffle run pace. I told myself to run every time I saw a bus lane and kept my walking pace at the fastest I could handle. Coaches, vans, lorries and cars were now overtaking at a crazy rate. The course was disappearing as I ran each step and I was convinced if I were to stop and turn around it would be like the course never existed. But somehow I managed to keep just a few steps in front of it all. A very scary moment that keeps playing in my head was when I saw a very distressed and delusional runner (due to heat I imagine) attempt to run from medical care they were receiving. They almost tipped up sideways at such a speed and hit the floor so hard. As I ran past they were attempting to provide aid as the runner cried out and seemed to have a seizure. I started to grow concerned for everyone around me, worried that someone else would succumb to the heat and due to how quiet some of the sections had grown, I was worried how long it would take someone to notice and bring help. Luckily the St Johns Ambulance seemed to be everywhere, with sweeper coaches picking up the injured and poorly runners on the course. Clara had managed to jump on a tube from Tower Bridge and suddenly appeared at the side of the course with a bottle of water. Both M and her attempted to keep up with me as I blew kisses and charged forward, now just set on getting across the finish before the roads reopened. Just after mile 21 my parents met me with words of encouragement. “Don’t stop!” my Dad shouted, “We are going to come with you for as long as we can”. It was then I noticed all the runners around me had picked up their own team of supporters. Passing runners soon became a mission of passing them and their families. It felt like the crowds in places may had left, but we now had our own mobile crowd. Dad worked out the pace I was at and what I needed to maintain to get in before 8 hours and soon my finish had really become a race against the clock. I was determined to finish across the official finish line before the traffic forced it on to the path. My parents grabbed water for me as we passed charity supporters offering what little water there was left on the course. 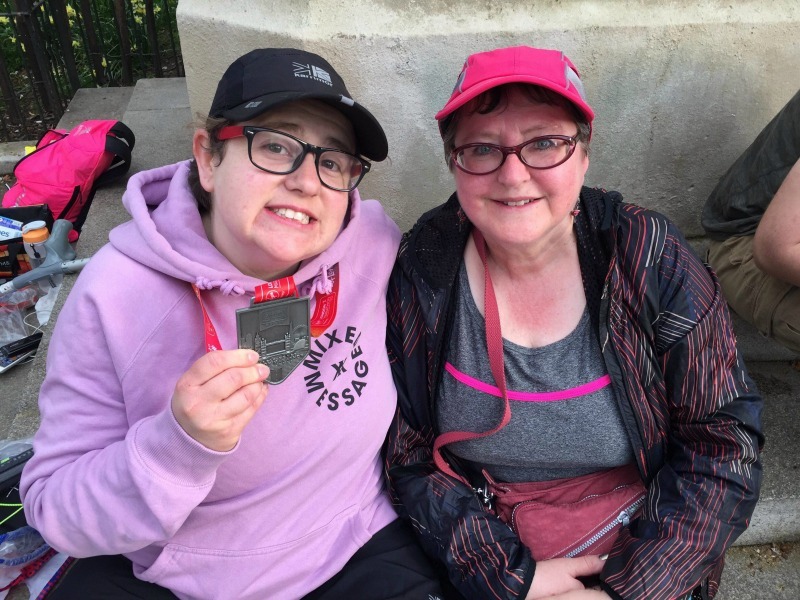 We weaved in and out of coaches, squeezed down the side of lorries full of barriers and in one point had to walk the length of 3 coaches twice to get back on the course as they moved us onto the pavement for a short section. The run had become one of the most bizarre things I had ever considered as we battled road sweeper vans and coaches as the wheels ran over water bottles, sending them bursting towards us. I remarked to my Mum that it had started to seem like I was in my own Hunger Games film. Soon my pace was too much for my dad’s Knee to take (he is awaiting a knee op). He yelled at us to keep pushing on and said he would meet us at the finish. Soon the London landmarks started to come thick and fast, there was no slowing down now as I asked my mum to just talk gibberish at me to take my mind off the pain. My right hip was now feeling like it was about to pop off and leave me displaced on the side of the road. The blister on the bottom of my foot was hot and sore and created a stabbing pain up my foot every time it hit the floor. I was still managing to overtake a couple of people now reduced to shuffling towards the finish as they battled their own painful limbs. As I reached Big Ben the crowds suddenly grew again, pub goers were stood at the side of the road singing our names as we passed. I forced myself to smile, wishing to show appreciation, but looking back at photos I fear I just grimaced at them all as I held a rather tired thumbs up towards them. The signs now changed to meters as we approached the finish. I knew Clara and M were waiting for me opposite Buckingham Palace and this helped me to keep moving one foot in front of the other. People shouted well down ladies as my mum shouted back “I’m just a supporter” as she giggled, laden down with a bright pink rucksack and picnic bag. Then I was at the corner they talk about in training, the one where you have 385 yards to go. I turned it and Clara and M were there and they joined me on the course. “Keep going, I am so proud of you” was exactly what I needed to hear from my wife as the LONGEST 385 yards of my life lay before me. Then I could see the finish line…… and I knew I had to run, I promised myself I had to finish running. I ran with everything I had left in the tank, I saw the clock counting the seconds I was taking as the finish grew closer. 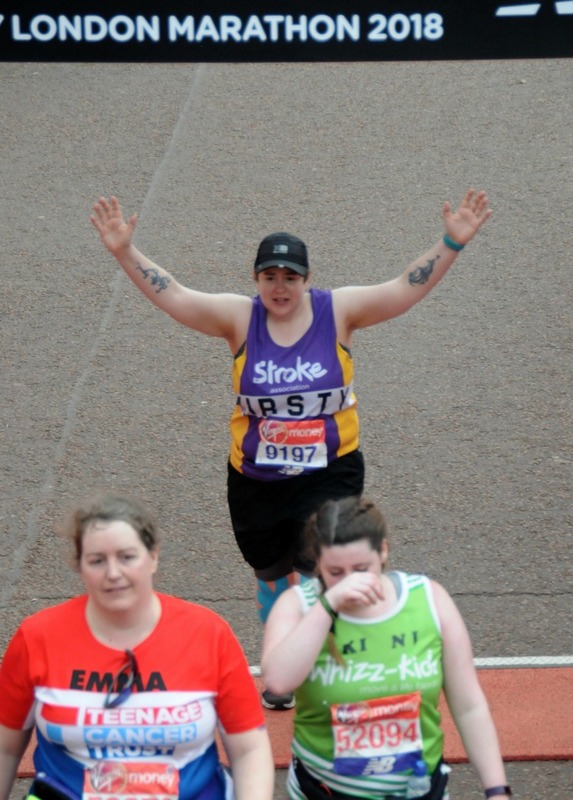 When I dreamed about this moment I knew there was only one way I wanted to finish and that was with my arms held high in celebration of the enormous challenge I had just completed. I crossed the line, my phone immediately beeped with an official notification of the time I finished and I stepped forward to receive my medal. The guy presenting my medal made me feel like the most important person on the course. 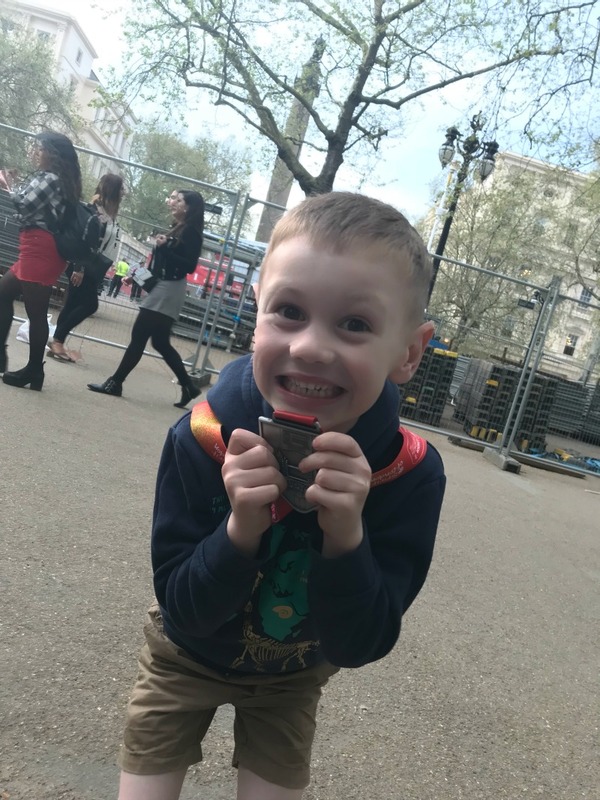 In fact the way he presented my medal was almost like I’d come first. As he placed it round my neck I began to sob, he placed his arms around me and embraced me, which ordinarily would have put my mind into a meltdown, but in that moment it felt like exactly what I needed. Goodie bags were handed out as I shuffled towards the meet and greet area, now suddenly aware of how much my body was hurting. An even longer shuffle than I ever imagined was needed to pick up my kit bag and then I was in the arms of Clara and feeling like I had become a new version of myself. I downed a recovery shake I’d instructed Clara to carry with her to the finish and was pleasantly surprised to finish without a headache or without a terrible thirst. 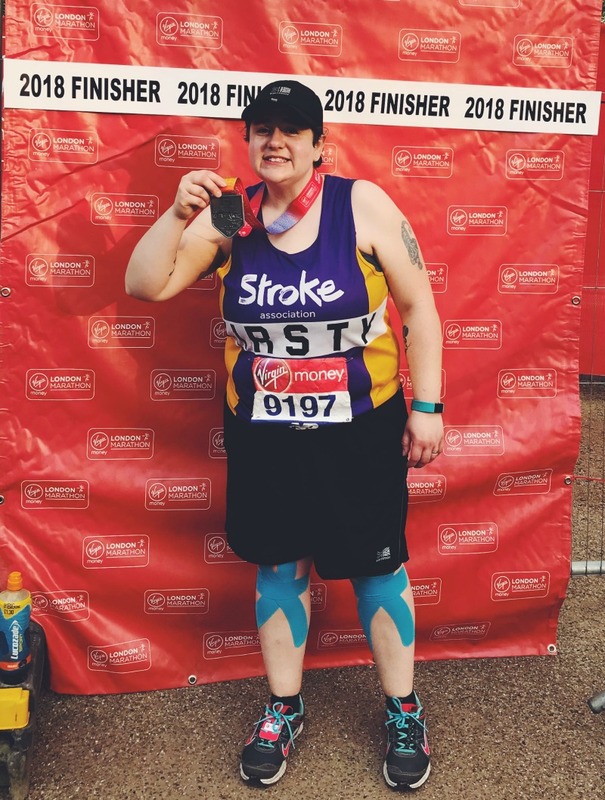 Despite the huge water station issues on the course I had managed to keep myself hydrated in the hottest London Marathon ever. I still can’t believe I am now a World Major Marathon runner and checked something off my life list I feared I’d never get the chance to do. 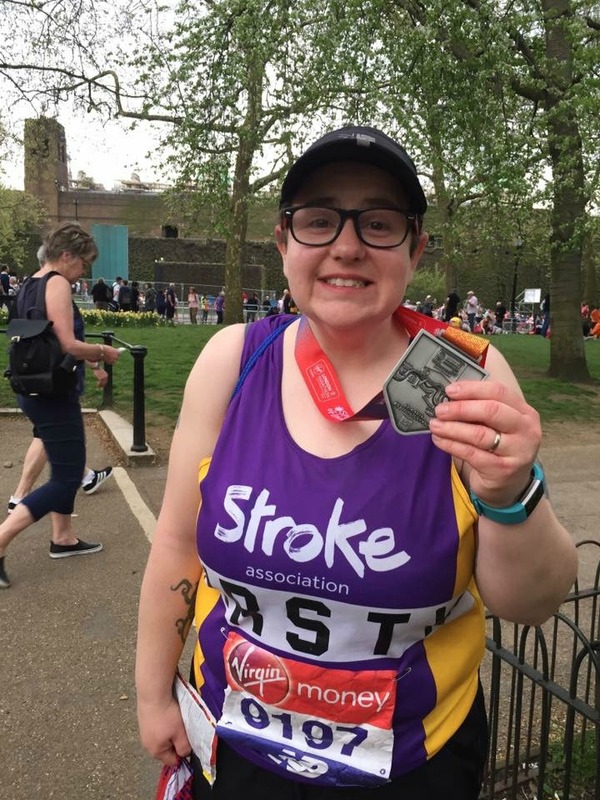 By the time I crossed the finish line I had raised over £1000 for The Stroke Association and you can still donate for the next few months and it would be amazing if you did! I just came across your blog from another blog and this is the first post I’ve read of yours! But this is a truly inspirational post! Well done on finishing and it’s something you can be proud of forever!